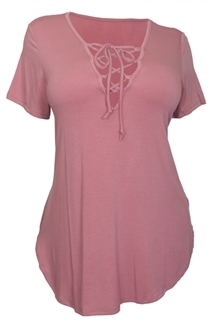 Women's top features short sleeve design with deep cut v-neckline. Light and airy jersey knit fabric Lace up detail. Round hemline. Available in junior plus size 1XL, 2XL, 3XL.